If you are looking for a degree that is considered qualification for many entry-level careers, Online Bachelors Degree Programs offer many options. Whether you are interested in fine arts, arts, business administration or science, the direction you take in your undergraduate years may be a crucial step in personal and professional development. Distance-learning is considered a convenient alternative to attending college or university in person. If this sounds interesting to you, take a look inside an Online Bachelors Degree Program to check out the many potential benefits to this program format! Wondering what it means to pursue a Bachelor’s Degree online? The term bachelor’s is actually derived from the Middle Latin word baccalaureus or baccalaureate, from the modern Latin word baccalaureatus. [i] In the 12th century, “bachelor” was used to refer to a knight bachelor who was either too young or too poor to gather supporters. A century later the term was also used by junior members of guilds and universities, and through common use, came to reference laurel berries, or bacca lauri. Laurels were awarded for honors or academic success. Today’s use of “bachelor’s degree” means an undergraduate academic degree that is awarded by colleges and universities upon completion of their program. An online bachelor’s degree is a program that is completed via web-based educational technology that replaces an onsite classroom with a virtual one. How Long Does It Take to Get an Online Bachelors Degree? Most Online Bachelor's degree programs require approximately 120 hours of coursework to complete. That translates to roughly a 4-year course of study. 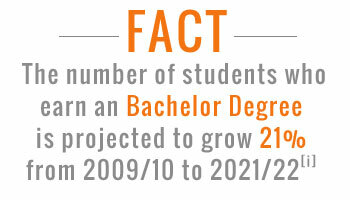 Keep in mind that how long a Bachelors’ degree takes is variable. There may be longer programs depending on your subject or you may choose to study as a part-time student. For instance, a Bachelor of Science may take 3 to 5 years. You may also look into Accelerated Programs if you also want to earn a masters degree and are looking to speed the whole thing up. Enrolling in an Online Bachelors degree program permits you to attend your virtual classroom from anywhere with a computer and a reliable Internet connection. It also means that your program might offer lecturers from other parts of the globe that are renowned in their field. The best part? No travel or commute time. Educational technology and innovative digital tools (web cams, web chats, emails, texts, video, Mp3 recordings) keep you connected to your fellow classmates and professors and you may have some participatory experiences through online group assignments. Also, virtual libraries mean you get to do your research online as well (e-books are pretty portable! ).Coursework is typically managed through an online course management system with a portal for submission of assignments. Either the program is asynchronous (lectures pre-recorded) or synchronous (live-streaming). Note to self: Check this detail with the prospective college. Just because you are choosing to earn an Online Bachelor's degree doesn't mean you won't need outside assistance like your campus peers. Review your prospective university to see that their online program has good technical support staff. Make sure that if you need access to a professor it is a possibility. You may also want tutoring or guidance counseling. Ensure that you are setting yourself up for a successful online student experience just as you would if you were attending an onsite program. Online Bachelors degree programs are available in many different fields and disciplines. These are all undergraduate degrees but with different course curriculums. Let’s take a look at four tracks, the Bachelor of Fine Arts (B.F.A. ), the Bachelor of Arts (B.A. ), the Bachelor of Business Administration (B.B.A.) and the Bachelor of Science (B.S.). Business, science, education and humanities are popular fields of study offered by most colleges and universities at the baccalaureate level. It may not show on your transcript that you completed your degree online instead of onsite, so for now, we’ll just give you a few details that might help you navigate a search for the type of program that aligns with your interests. B.A. is the standard undergraduate degree awarded for students seeking a degree in the liberal arts and sciences (think: humanities, English, art, music, modern languages and communication). BBA is the standard undergraduate degree in commerce and business administration. For some students it might be a precursor for an MBA. Online B.A. or Online B.S. Degree: What Will It Be? In terms of academics, both the Bachelor of Arts degree and a Bachelors of Science degree are valued and lay a potential framework for you to continue on to a master’s degree. They both tend to take 4 years to complete. Where they differ is that their respective coursework tends to hone separate proficiencies. Coursework for an BA might strengthen your communication and writing skills, while an Online BA might foster analytical, technical and practical facets of the field you are studying. What you might do is research your longer-term academic or professional goals and try to support them with your undergraduate degree. You are ready to pursue an Online Bachelor’s degree when four words come up: Major, Minor, Core Curriculum and Electives. Don’t panic. That is what academic advisors are for, and a good online program should have someone who is there to support you in your decision. Major: Your undergraduate major is your main area of concentration (maybe 30-80 credits). Sometimes students choose a major with a concentration. You might be a business major with a concentration in marketing or a History major with a concentration in art history. Minor: Your minor is usually a side interest that either complements your major or your intended career path. For instance, you may choose to Major in business administration with a minor in finance. Core Curriculum: It is fairly common to find online Bachelor's degree programs that oblige you to complete general education courses – also referred to as the core curriculum. Depending on your academic field, this may include philosophy, languages, math, science, fine arts, history and English. Electives: Are other classes that allow you to learn about a particular topic or area of interest. These encourage your to get an interdisciplinary perspective on your chosen path of study.